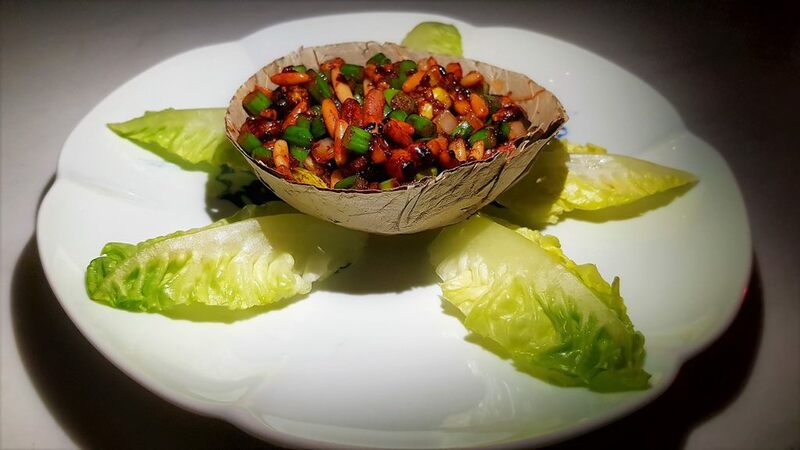 Hakkasan is undoubtedly one of Dubai’s fanciest restaurants and arguably one of the best Chinese restaurants in the whole of UAE. 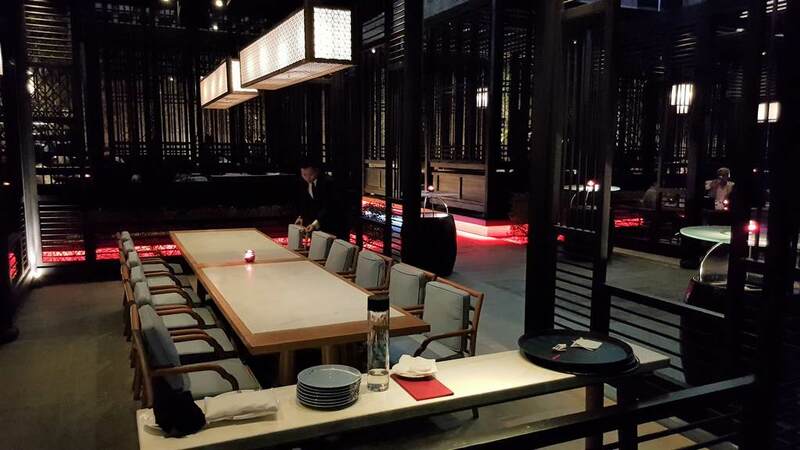 Thanks to the incredibly high standards it has set, Hakkasan is often bench-marked as a restaurant-to-compare pitted against new comers and other contenders in the category. So, needless to say - when we got an invitation to visit Hakkasan for a review, we grabbed the opportunity. A restaurant that has consistently won accolades and honors since its launch, Hakkasan lives up to its prestigious ranking by offering exquisite food, remarkable milieu and supreme levels of service, much like its counterparts in other countries. Flaunting a fantastic selection of exotic Cantonese dishes and an extensive line-up of spirits and world-class cigars, Hakkasan leads the list of top luxury restaurants in the Dubai. Equally as exotic as the food is the ambiance. Hakkasan’s interior exudes a lavish Shanghai-Chinois chic, rich in texture and detail, and animated by a luxurious array of ambient sounds, scents and lighting. The warm hues of the mood-lit interiors create the perfect synergy for either professional get-togethers or intimate dinners. 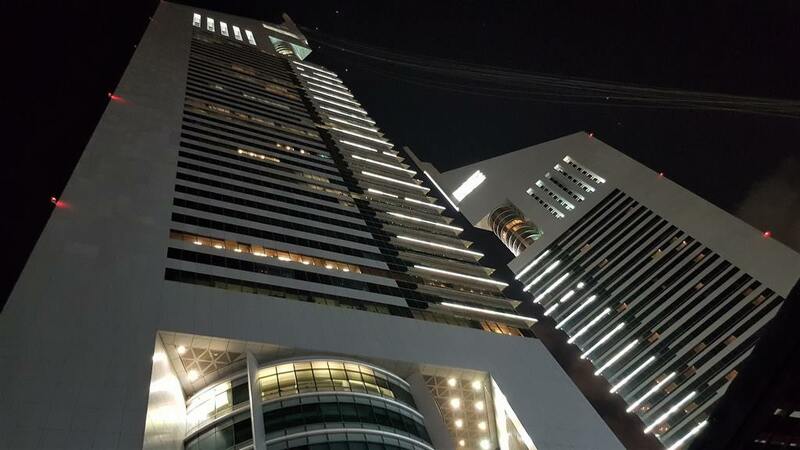 Housed in the posh and elegant Jumeirah Emirates Towers, its every bit as luxe as you'd expect a property on this opulent hotel tower to be. 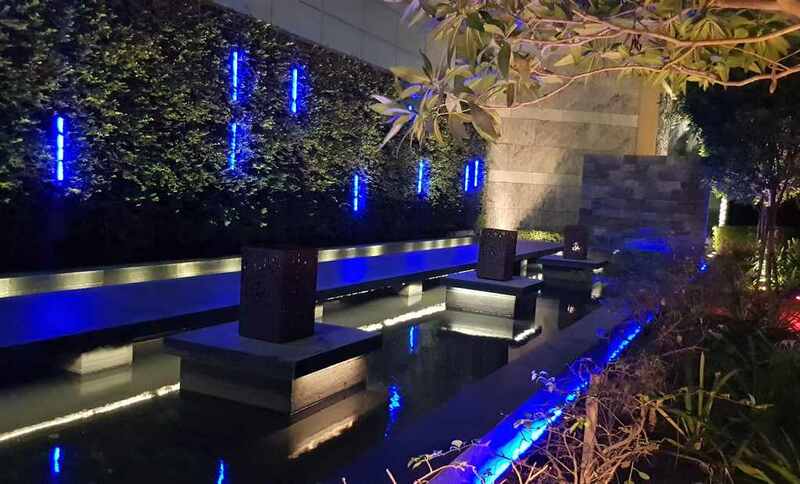 A huge lit wall with the brand insignia takes pride of place in the entrance and behind this - a mood-lit walkway staged on water leads you to the uber-slick interior. You can see distinctly modern aesthetics combining with traditional Chinese motifs to give the interior a unique charm and graceful vibe. Ornamental Chinese Lattice design adorn the dining areas and add a touch of authenticity and class, while dexterously carved wooden screens create intimate dining areas within the restaurant. On the outside a gorgeous terrace with a stunning view of the tower, wooden pavilions and mood lighting create an environment for a stellar outdoor dining experience. The restaurant’s 112-seat terrace features rustic wooden pavilions, lush exotic greenery and Hakkasan’s signature oak latticing. 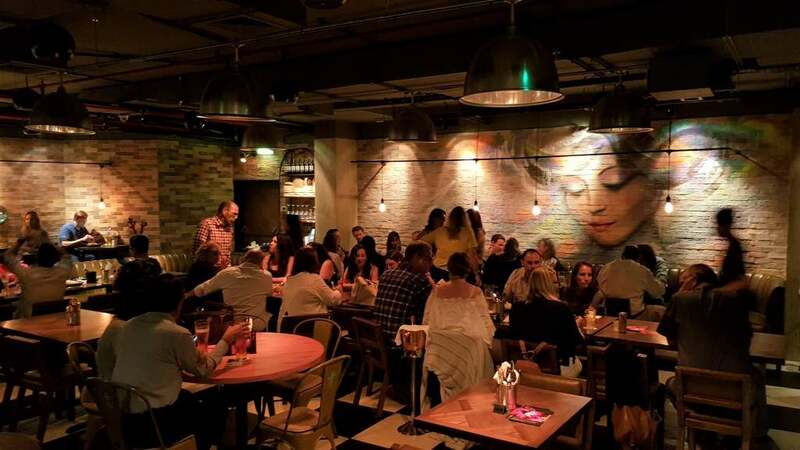 The restaurant can accommodate 152 guests, including the opulent Ling Ling lounge – a popular venue for high end get-togethers. I started off with some pre-dinner drinks. 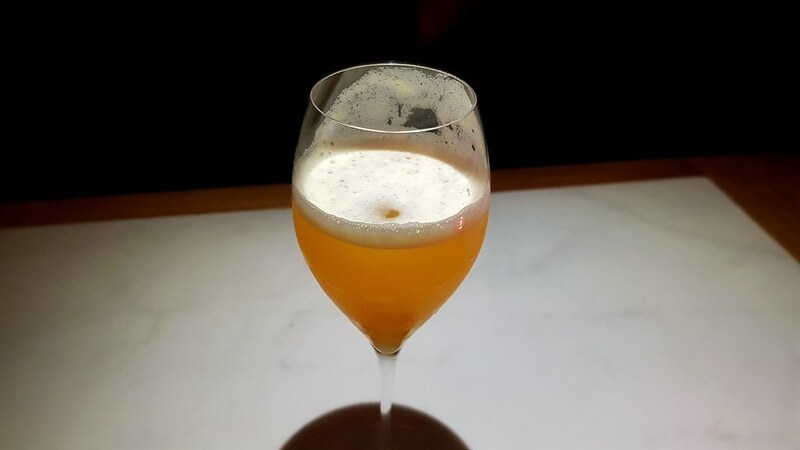 I took the waiters recommendation and went for Silva Leaf - a lovely concoction of Kome to Mizu sake, Champagne, passion fruit and house-made Chinese five-spice syrup. 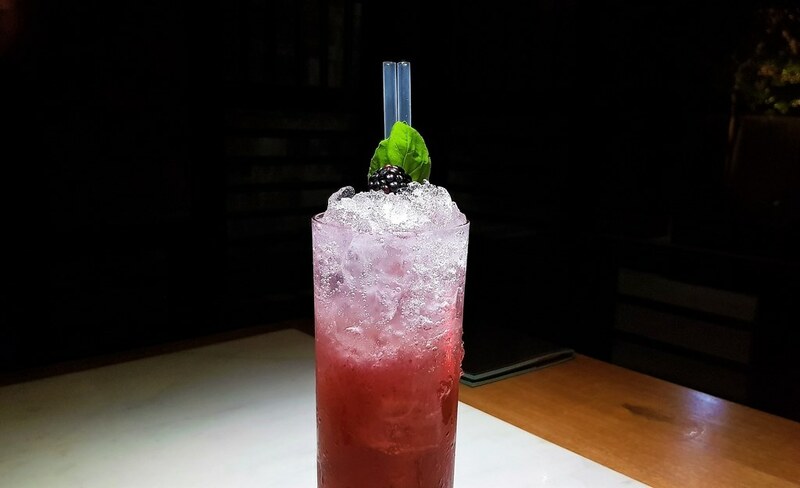 I followed that up with the slightly sweeter Velvet Sling – another delightful cocktail blend of Lillet Blanc, nettle cordial, blackberries, raspberries, basil, cinnamon and apple juice in Ketel One vodka. Hakkasan has a very gorgeous, well-stocked bar for pre-dinner drinks. The live DJ whipping out heady soundtracks is a bonus. For the soups we had Hot and Sour with Chicken Soup and Sweet corn soup. I always believe a really good soup can be a nice omen for the great food to follow and Hakkasan didn't disappoint. The Hot and Sour Chicken soup was distinct and undoubtedly one of the best I’ve tasted in town. 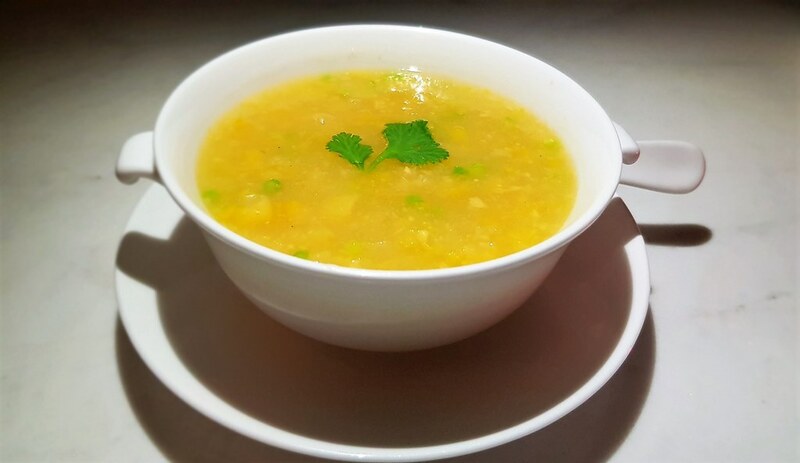 Sizzling hot and bursting with flavor, the soup served as a perfect start to the meal. My dining companion who savored the Sweet Corn Soup reflected similar sentiments. For entrée, we ordered from the Only at Dubai collection - a selection of dishes, desserts and cocktails showcasing the local Dubai cuisine and culture. The Only At collections vary from country to country and employ ingredients and flavors resonating with the locations where it is served. 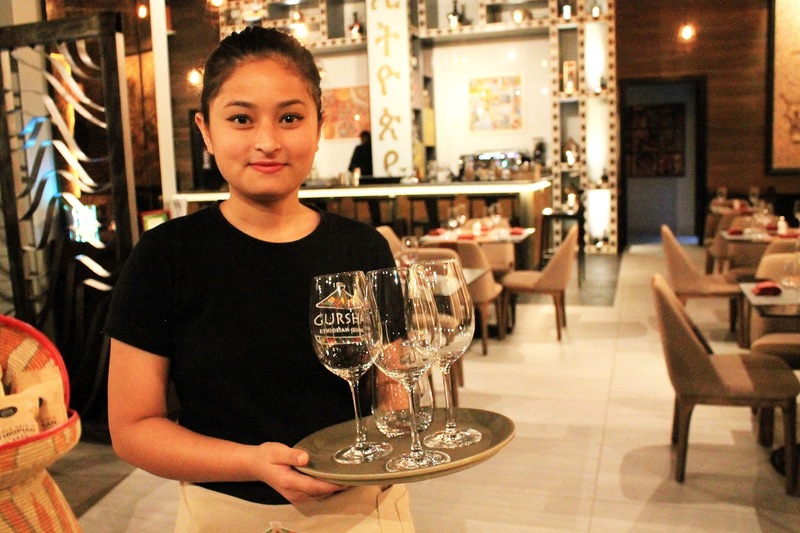 The Only At collections in Abu Dhabi, Dubai and Doha feature ingredients influenced by the region, such as saffron, dates and orange flower water. Delicate cinnamon and chilli spices in the cocktails are a specialty of the Only At Dubai collection. This was by far the best part of the meal. The Fried Dim sum Platter looked premium and tasted heavenly. 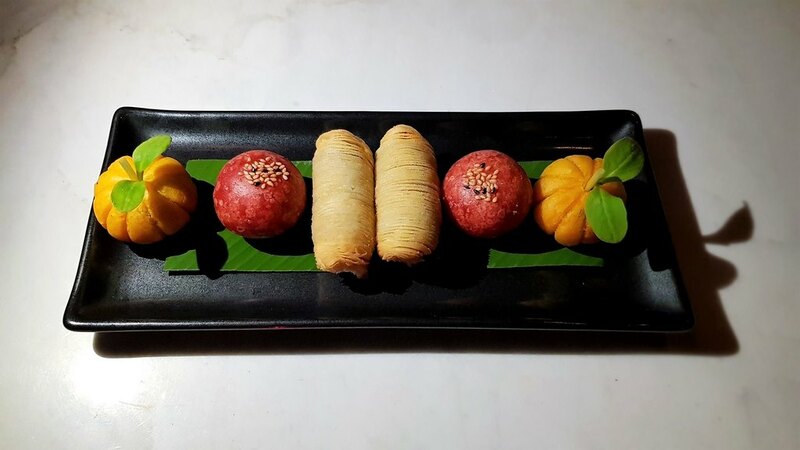 The platter comprises of 3 items - roast duck pumpkin puff (that actually looks like a small pumpkin) mushroom & foie gras dumpling and wagyu beef & mushroom puff. There’s a reason this place has been showered with awards over the years!! 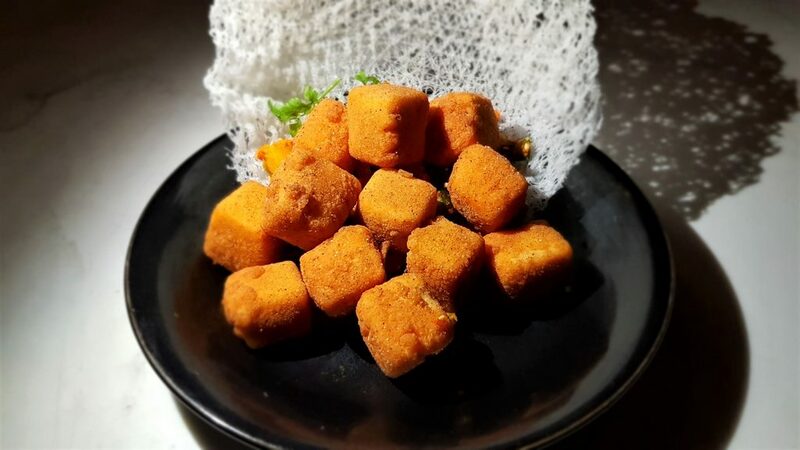 While the Cantonese are credited with the world's best dim sum, I strongly believe Hakkasan needs to be ranked/rated A+ for the country’s best Cantonese Fried Dim Sums. Fiery, both from the chillies and the black pepper yet in a delectably moderate manner, the dish was soft, luscious, crisp to the right level and an absolute delightful to savour. This dish is all about texture and as the combination of crunchy, crisp, and tender bits came together in the mouth, it was a feast for the palates. Savoury and spicy, this dish proved that sometimes vegetarian recipes can be just as substantive and flavorful as meat dishes. My vegetarian dining partner couldn’t have agreed more. Honestly, the best I've tasted anywhere – the fried golden prawns were succulent, luscious and absolutely delicious. The sweet creamy orange dressing seemed to complement the tenderness of the prawns well, giving it all that overall balanced flavor and taste. 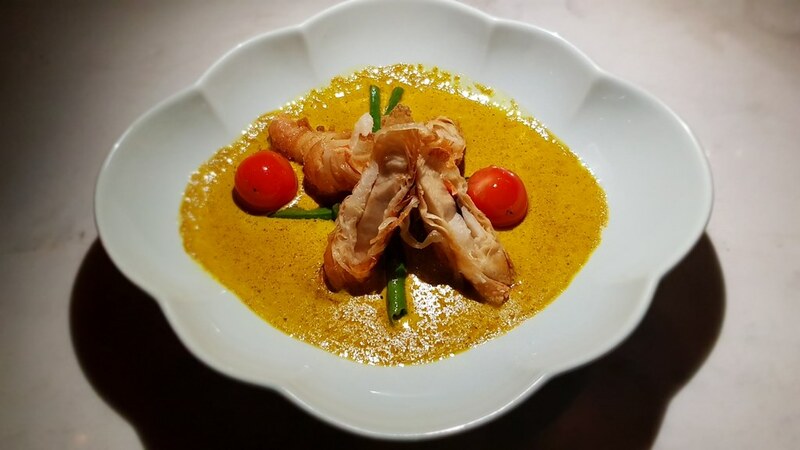 Crispy Bean Curd Wrap in Spicy Lemongrass Sauce. 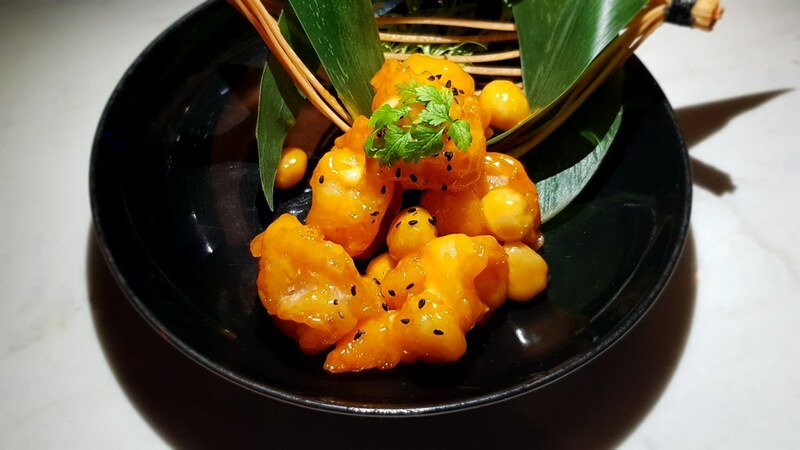 Also fantastically good, this Hakkasan delicacy is a mouth-watering bite full of flavour and texture, accentuated well by the spicy lemongrass sauce. 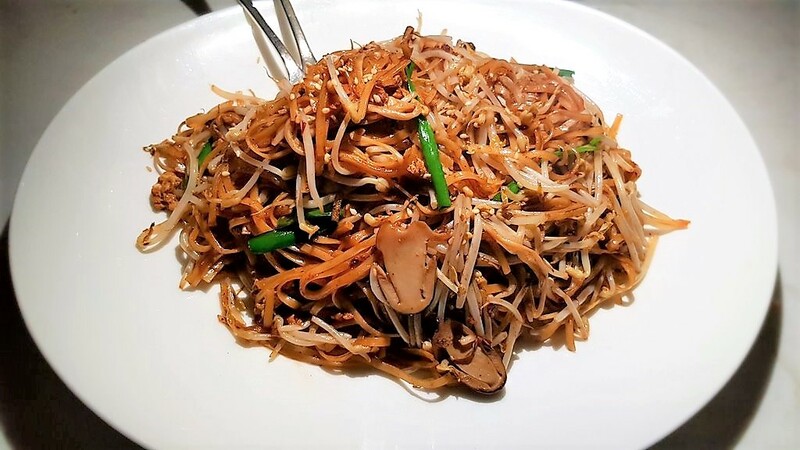 Yummy, flavourful and as authentic as it can get, Hakkasan's hand pulled noodles are a class apart! 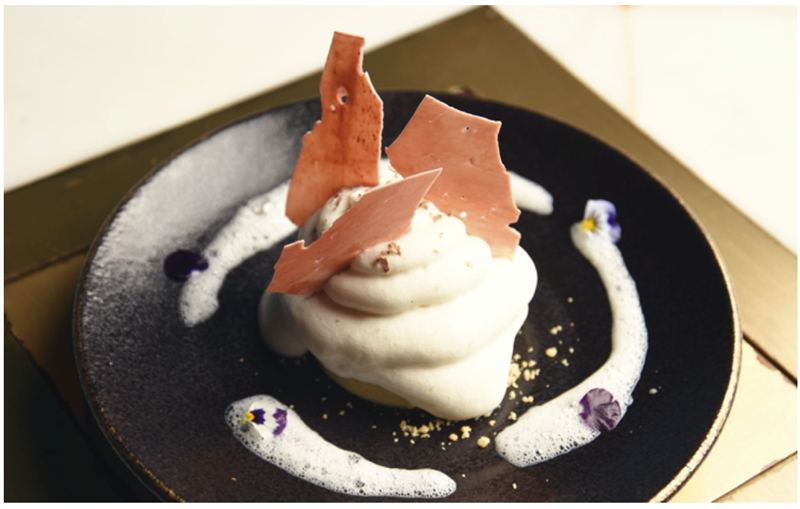 Everything on Hakkasan’s menu seemed to be top-notch including the desserts. The very look and presentation of it made our mouths water and we couldn’t wait to dig into it. 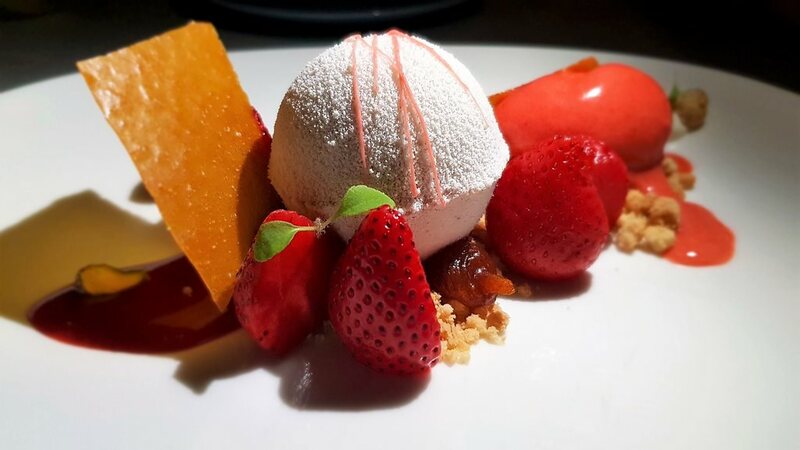 And trust us when we say – this dessert tasted as fabulous as it looked. We gorged on this gorgeous dessert after our customary food bloggers clicks. If you want to enjoy the finest of Chinese delicacies in imperial splendour, then Hakkasan is your perfect destination. The punchy cocktails, lip-smacking food, uber-slick milieu and impressive service will make your dining experience a delicious pleasure. This review was a sponsored by Hakkasan. I was invited on the same terms as other food bloggers – to give feedback on their 'Only At Dubai' Collection. 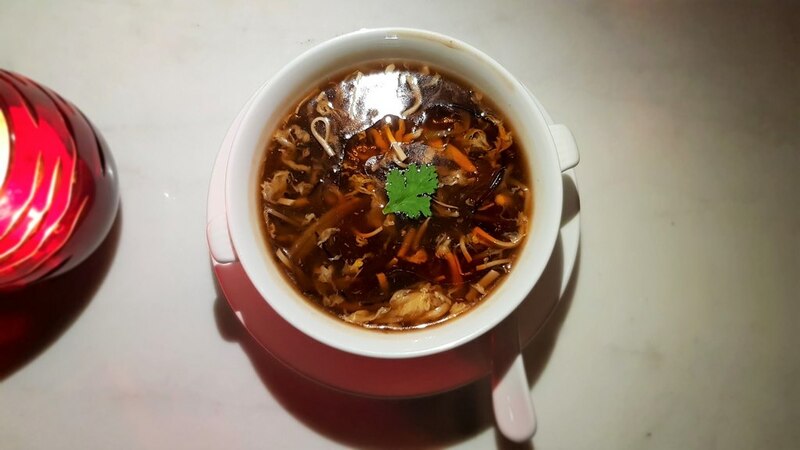 The restaurant had no influence on the content of this article, there is no form of cooperation between us, I was not obliged to publish anything, and I received no monetary payment.